In this issue, I’d like to introduce the word, indefatigable (indəˈfadəɡəb(ə)l). To be indefatigable means to be tireless. Quite literally, the word means unable to be wearied or tired out. The word itself traces back to early 17th century; so, it’s one that we don’t hear much anymore, at least in casual conversation. Nevertheless, it’s a word that conveys a powerful message, and, so, has shown up in history, literature and popular culture. Six ships in the British Royal Navy have carried the name HMS Indefatigable. The fictional character Horatio Hornblower served on the HMS Indefatigable. The word even appeared in the popular Star Trek series, as the name of a Starfleet ship. So, to label someone or some group of people as being “indefatigable” is to pay them a high compliment and to commend them on their tenacity, work ethic and perseverance. Thomas Edison once said something to the effect that genius was one part imagination and many parts perspiration. Edison was indefatigable. He recognized that progress takes persistence and effort, and he understood that over the course of many trials and errors, we learn what works and what doesn’t. In so doing, we develop the skills and flexibility to adapt to changing circumstances, and we build that sense of momentum and purpose that can sustain us through our inevitable setbacks and mistakes. I suspect the vast majority of those who make real and positive change in the world are, like Edison, indefatigable. They work hard; they learn and adapt, taking what the world gives them and making it better, even in the face of negativity and doubt. Among the many things that make me proud of Georgia Southern is our reputation for tenacity and hard work. Whether in sports, academics or business, no one outworks us. Our graduates are known to jump in quick, to learn fast and to stick to it until they get results. I hear the same story over and again as I travel around. Our graduates will roll up their sleeves and work when others will often stand back and wait. And that means a lot in a demanding and competitive world. Indeed, that’s the sort of attitude and effort that will eventually change the world. So, when you think about the College and about the Eagle Nation, remember this old word, even if it’s a new word for you. 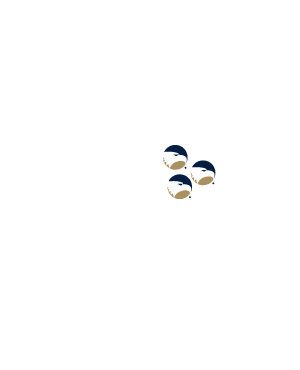 Georgia Southern alumni are indefatigable, and that is a high compliment. When Moira Sheehan completed her MBA in 1998, she never thought she would become an entrepreneur owning an auto care business; however, Moira has worked on and raced vehicles since she was first able to drive, something that has become her passion. During her time in the Georgia Southern MBA program, Moira took classes in both Savannah and Statesboro. Her first job after completing her MBA was as a business management consultant for a company that Computer Associates outsourced to. After that, she traveled the world–Costa Rica, Mexico, Ecuador, Canada and all over the United States–for a few years, working for big companies such as Merck and Co., Hallmark Cards and Gulfstream Aerospace, among others. Once her, now 17 year old, son was born, Moira decided to open her own consulting firm, working with large and small businesses in the Savannah area. This eventually led her to open an auto repair shop in 2008. 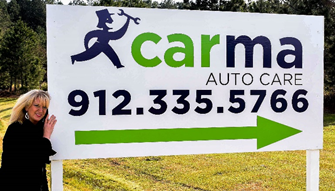 CARma Auto Care is a full-service preventive maintenance and auto repair center in Savannah. By specializing in general services, car and truck care, undercar services, alignment, brakes, tires, engine and transmission, engine maintenance, transmission services, 4×4 services, heating and cooling services, towing and quick lube services, Moira believes in showing her customers the repairs needed and educating them so that repair dollars are spent the best way possible. CARma Auto Care services all makes and models of vehicles, both import and domestic, up to 12,000 lbs. 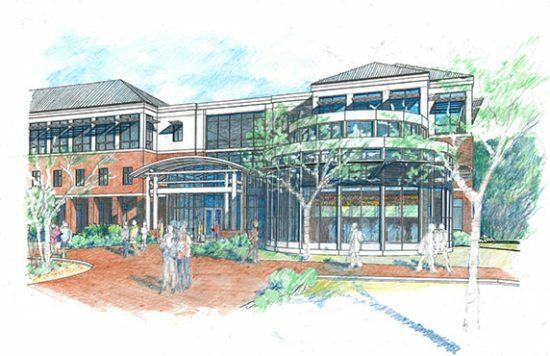 Moira plans to open a welcome station at the Savannah/Hilton Head International Airport, the first of its kind in the United States. Customers will drop off their cars in valet parking, check in on a tablet and tell Moira which repairs, detailing and errands they need completed while they travel. When they return home, the work will be done, giving customers more free time to do what they want to do. To learn more about CARma Auto Care, visit carmaautocare.com. On February 8, 2018, AACSB International—The Association to Advance Collegiate Schools of Business (AACSB), the world’s largest business education network, celebrated the positive impact business school graduates are making in communities around the globe as part of the 2018 Influential Leaders Challenge. As an annual initiative, the challenge honors notable alumni from accredited schools whose inspiring work serves as a model for the next generation of business leaders. Georgia Southern College of Business alum Major General Leslie C. Smith was recognized at AACSB’s 2018 Deans’ Conference in Las Vegas, Nevada, among a group of 29 business pioneers from 13 industry sectors whose careers are addressing today’s most pressing social, economic, environmental and educational challenges. Smith serves as Inspector General, Office of the Secretary of the U.S. Army. After graduating with an accounting degree in 1985, Smith entered the U.S. Army as a chemical officer. In 2001, he assumed command of the 83rd Chemical Battalion, where elements of the Battalion deployed in support of Operation Enduring Freedom. 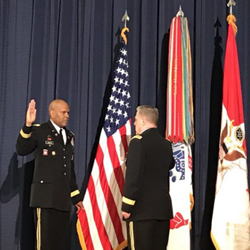 Following command, he served on the Army Staff in the G-8 as the Deputy Division Chief and Chief, NBC Branch for the Full Dimensional Protection Division. In 2005, Smith assumed command of the 3rd Chemical Brigade at Fort Leonard Wood, later serving as the G-3, 20th Support Command (CBRNE), and from 2008 – 2010, the 25th Chief of Chemical and Commandant of the United States Army Chemical, Biological, Radiological and Nuclear School. In 2010, he became the fourth Commander of the U.S. Army 20th Support Command (CBRNE–Chemical, Biological, Radiological, Nuclear and High-yield Explosives). Prior to his current position in the U.S. Army, Smith was Commanding General of the United States Army Maneuver Support Center of Excellence and Fort Leonard Wood. In 2017, he was named the Georgia Southern University College of Business Alumnus of the Year. Smith has an impressive record having earned the expert parachutists’ badge, the Distinguished Service Cross, the Bronze Star with an Oak Leaf cluster, and the Army Commendation Medal with Oak Leaf cluster. Smith has received 22 medals, awards and badges throughout his years of service to our country. Leaders serving nonprofit and community-based organizations are making game-changing impacts—from a local level to a global reach—creating a better society for us all. With initiatives that include navigating the Hurricane Harvey crisis, transforming the lives of more than 150 million children around the world annually, and combating the root causes of poverty, AACSB graduates demonstrate that some of the world’s most impactful work occurs within smaller-sector opportunities. Advocates for diversity and inclusion are driving transformation across the corporate sphere by upholding a culture of mutual respect and championing the exchange of open ideas. Such efforts are furthered by leaders who forge and refine inclusion practices—based on appreciating differences—to break down cultural stereotypes and patriarchal norms. They also look to inspire today’s youth in under-represented populations to pursue their dreams in non-traditional fields of study and professions. Businesses need students to be workforce ready upon graduation, making the present a critical time for schools and businesses to work together to meet each other’s needs. Outside of academe, some business leaders are driving fruitful partnerships between the two groups by cultivating a spirit of entrepreneurship and cross-collaborative mindsets. Others are developing free study services—available via a simple digital exchange—to more than 350,000 students globally, advancing access to success for everyone. Inside academe, leaders are transforming institutional culture by encouraging open dialogue between alumni, faculty, staff, business, and students, while investing in promising entrepreneurs across advantaged and disadvantaged regions. For more information on the Influential Leaders Challenge, and to view a full list of honorees, visit aacsb.edu/influential-leaders. Following this announcement, Major General Leslie C. Smith was promoted to three-star Lieutenant General in the U.S. Army on Friday, February 9. This promotion makes Smith the highest-ranking University alumnus in the military. To read more, visit the Georgia Southern Newsroom. 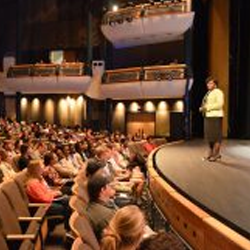 The College of Business proudly welcomed Kimberly Ellison-Taylor, the 2018 Executive-in-Residence and Distinguished Forensic Lecturer, to the Georgia Southern University Performing Arts Center on Tuesday, January 23, 2018. Ms. Ellison-Taylor explained how she had a rough start in life, growing up in inner city Baltimore; however, despite her disadvantaged environment, Ellison-Taylor’s parents were determined she attend school and have a successful career. Originally, her parents wanted her to become a doctor, but she knew that the only career she wanted to pursue was that of a Certified Public Accountant (CPA). The Georgia Southern College of Business was very privileged to have Ellison-Taylor, as she is a sought-after speaker who has received numerous awards, being recognized by Accounting Today as one of the 100 Most Influential People in Accounting in 2016 and also by CPA Practice Advisor as one of the Most Powerful Women in Accounting for 2016. In her powerful speech, Ellison-Taylor explained how to thrive in the age of technological innovation, specifically aimed towards college students about to enter the workforce. “With college students being the future leaders of the world, creating things that haven’t even been thought of yet, everyone should seek and explore the highest credentials that can possibly be attained,” she said. Kimberly Ellison-Taylor’s coming as a guest of the College of Business is so important; having guest speakers share their own experiences helps students with their future career endeavors because they learn from failures and successes of people who were once in their shoes. During the Georgia Economic Outlook forecast held in Savannah on February 7, 2018, Michael J. Toma, Ph.D., the director of the newly-named Center for Business Analytics and Economic Research (CBAER) at Georgia Southern University, formerly the Bureau for Business Research and Economic Development (BBRED), presented the Savannah-area forecast. According to Toma, the regional economy, which includes Chatham, Bryan and Effingham counties, has added about 32,000 jobs since 2010. 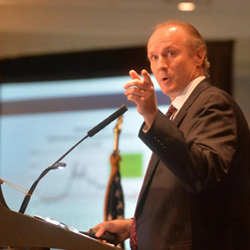 “That’s pretty significant growth after a loss of about 12,000 jobs during th[e] recession,” Toma said during the Savannah Area Chamber of Commerce’s annual Economic Outlook luncheon at the Westin Savannah Harbor Golf Resort and Spa. The majority of the growth in the local economy has been in the private sector. The private sector averages a growth in terms of employment of about three percent per year explained Toma. “We also have an economy that is very well diversified… with more diversification, just like with a financial portfolio you [have] less volatility, so you have a more stable environment,” he said. Area employment is also on the upswing with an expected increase of approximately 2.8 percent this year, which is above the long-term trend rate of 1.7 percent. At the close of 2017, the annual regional employment rate was 4.4 percent, which is the lowest rate since the mid-1990s. Toma expects further growth will lower that rate to 3.6 percent in 2018. “The labor market is very strong… We’re at full employment, and we’re about to go below it, in the sense that our unemployment rates are going to dip down with that creation of 32,000 jobs since 2010,” he said. Looking ahead, Toma expects the local economy to gain momentum for the remainder of 2018, propelled largely by capital investment projects in the area to include Plant Riverside, Savannah River Landing and the deepening of the Savannah River. “When you start to add up these numbers with a few hundred million here and a few hundred million there, those numbers add up to about $2.5 to $3 billion in capital investment in our regional economy,” Toma explained. 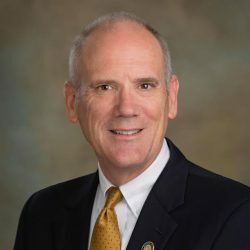 Following Toma’s regional outlook, Jeffrey M. Humphreys, director of the Selig Center for Economic Growth at The University of Georgia, gave the statewide forecast. 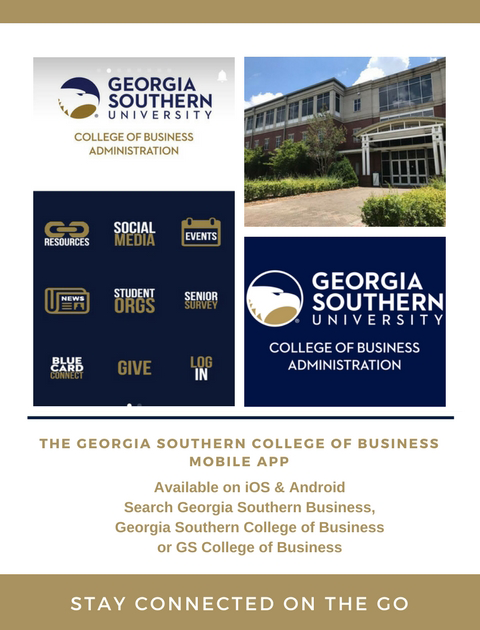 The Business Innovation Group (BIG) at the College of Business hosted the business pitches of the remaining five groups from 3 Day Startup Georgia Southern competition in the Russell Union Theater on February 19, 2018. 3 Day Startup is a 72-hour learning-by-doing campus workshop that teaches entrepreneurial skills to university students in an extreme hands-on environment. Forty students with a wide range of backgrounds formed start-up technology companies on Friday, February 16, at 2:00 p.m. and worked together until Sunday, February 18, at 10:00 p.m. The goal was to build enough momentum among a network of motivated people to sustain the startup company beyond the weekend. On the first day, with or without a startup idea, participants were introduced to a facilitator who led each group through dedicated brainstorming, preliminary pitches with feedback and team selection models. Some teams worked very late into the night, while others chose to rest in preparation for the following day. The second day placed heavy emphasis on business model generation. Each team was urged to delve into customer retention as well as obtaining structured mentorship, intermediate pitches and feedback sessions. The final day consisted of continued execution of ideas leading into the final pitches and demos to an esteemed panel of mentors and investors. After the intense 72-hour collaboration session, five groups, NIA, Tailr, 5 Dollar Footwear, TAC and DIS, made it to the final round of pitching their businesses to an esteemed panel of mentors and investors as well as the public in the Russell Union Theater on Monday, February 19. The first finalist, NIA, was created by Tinia Holmes, Gustavo Silveira, Chasmia Hill and Hannah Dasher. This company was created to produce a one-of-a-kind, cost-conscious brush that distributes hair-care products into the user’s hair as it brushes. Brushes would sell between $8–$12 through multiple retailers. The company’s go-to-market strategy would be through niche retailers, e-commerce, YouTube bloggers or influencers and social media branding. The next finalist, Tailr, was inspired by the problem of no two brands of clothing fitting the same. This company will employ a digital measuring system using a cellphone camera or webcam, building an intermediary between retailers and consumers. Tailr’s go-to-market strategy to attain retailers would be through trade shows, email marketing, small-time social media celebrity and popular channel endorsement. 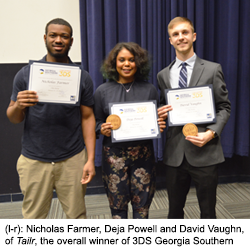 David Vaughn, Marin Coleman, Deja Powell and Nicholas Farmer created this innovative app to capture a client’s measurements digitally. Louis Mayronne, Cecilia Robinson, Rebekah Morris, Jahsiah Kidd, Hunter Cornett, Luis Rivera and Brandon Brison made up the third finalist team, 5 Dollar Footwear, that recognized the problem of wanting stylish shoes but having a limited supply of money. The solution would be a free app to provide $5 shoe decals and a chance to win a pair of shoes. Social media, word-of-mouth and referrals would be the go-to-market strategy. The fourth finalist, TAC, was created to provide a higher quality drinking cup, designed to be rugged and durable for the on-the-go lifestyle. TAC cups will consist of durable plastic construction, rotomold uniform density plastic, insulation engineering and heat dissipation as well as threaded lids to prevent popping off. The immediate market will be retail stores carrying outdoor adventure lifestyle brands as well as veteran-owned businesses. Josh Curtis, Mohammad Abdallah, Jason Blackwell, Marin Coleman and Marcus Cook set their short-term goals (12–18 months) to achieve viral advertisement and inclusive partnerships with veteran-owned companies. Their medium-to-long term (19+ months) goals included distributing their product in retail stores at military installations, sending products in deployment care packages, having a company website and sales analytic monitoring. The fifth and final company, DIS, would produce a durable, long lasting, water, shock and UV resistant longboard. Evan Duffield, Elijah Valladares, Marin Coleman, Delia Lazarescu and Chikamso Anayo Achu’s short-term plans involved increasing brand awareness, finding influencers to promote the product and increasing local sales. Their medium- and long-term goals included purchasing more molds, accepting more customized orders, finding partnerships, expanding product selection and expanding to brick and mortar stores. After a 15-minute break, those attending the final pitch event voted on their favorite company, and the panel of mentors and investors determined the winner. DIS won the people’s choice award, while Tailr was the overall winner. Congratulations to the Tailr and DIS teams! On February 22, 2018, the Georgia Southern College of Business participated in the 20th Annual Tourism Awards and Scholarship Dinner hosted by the Tourism Leadership Council in Savannah. As the “I Am Tourism Award” sponsor, the College was well represented at the event by Rand Ressler, Ph.D., associate dean of the College of Business, Bob Hoell, Ph.D., department chair of management, Stan Suboleski, Ph.D., hospitality management lecturer, Yassaman Saadatmand, Ph.D., department chair of economics, along with current students Angelica Concepcion (MGNT, ’18), Samantha Seebachen (MGNT, ’18) and Kyle Ramby (MGNT, ’19). During the program, Associate Dean Ressler presented the I Am Tourism Award to Wendy McBride, general manager of the Holiday Inn Express Savannah Historic District. At the 42nd Annual Small Business Institute (SBI) Conference held in Corpus Christi, Texas, two Armstrong graduates won 1st place in the undergraduate, comprehensive Project of the Year competition. All SBI member schools are eligible to submit projects for consideration. This was especially impressive since only two students were in the group, which normally consists of at least four. 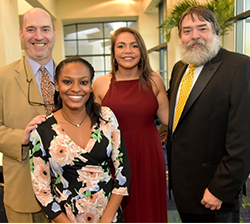 The student team included Heather Gaither (’17) and Otakar Lucak (’17) and the SBI Director Dennis Barber III, Ph.D. The consulting project was conducted to help Quantum, Inc., a non-profit located in Savannah, determine the feasibility and strategy for offering a new service. Quantum, Inc. is part of the Coastal Center for Developmental Services, which trains adults with developmental disabilities in preparation to join the job market. Jackie Eastman, Ph.D., professor of marketing, along with her co-authors, Dave Shepherd, Ph.D., professor of marketing, Raj Iyer, Ph.D., of Bradley University, and two College of Business Honors students, now alumni, Angelina Heugel (MKTG, ’15) and Don Faulk (MKTG, ’16), had their paper, “Do They Shop to Stand out or Fit in? The Luxury Fashion Purchase Intentions of Young Adults,” accepted by Psychology & Marketing. The research consisted of three studies – 1) a qualitative study based on Angelina Huegel’s Honors Thesis research, 2) a survey of college students based on Don Faulk’s Honors Thesis research, which built on and empirically tested some of the qualitative findings of Angelina’s research and built on Don’s thesis through utilizing a national sample and testing additional variables suggested by the findings of the previous studies; and 3) a study involving a national survey of 510 young adults, born between 1982 and 1998 with a quota sampled by ethnic group to ensure a diverse sample by utilizing a Qualtrics panel with the support of Georgia WebMBA faculty development funds. The article will be published in March 2018 issue. Jackie and her co-authors, Raj Iyer, Ph.D., Mitch Griffin, Ph.D., and Barry Babin had their article, “An Examination of the Antecedents and Consequences of Materialism: A Cross-Cultural Look at India versus the United States,” accepted for presentation at the 2018 Academy of International Business Conference this summer. The research was supported by a summer College of Business Research Grant. Congrats, Jackie! Stephanie Sipe, J.D., professor of legal studies, will be the sole panelist representing undergraduate education during the Information about the Gender Sidelining Symposium hosted by California Western School of Law, April 26-27, 2018. Congratulations, Stephanie! On Friday, February 23, 2018, Chris Brunt, Ph.D., assistant professor of economics, and Kwabena Boakye, Ph.D., assistant professor of quantitative analysis, presented their research during the first 2017 Summer Research Grant Seminar held in the College of Business. Brunt’s research, titled “Physician Competition and Quality of Care: Empirical Evidence from Medicare’s Physician Quality Reporting System,” explores the effects of physician practice competition on five distinct quality metrics directly tied to screening and follow-up care. Brent found strong evidence that physicians in moderately and highly concentrated physician service markets have lower quality ratings than those in unconcentrated markets. Further exploring differentiated effects across primary care and specialist providers, the results are predominately driven by primary care physicians. Boakye presented, “The Battle for Customer Loyalty: An Examination of Customer Loyalty in the Goods and Services Domain,” which examines how experiential and situational variables in a non-personal setting influence the customer’s decision-making processes to stay loyal to a firm’s product or service offering. An interpersonal relationship theory from social psychology, known as the investment model (IM), was used and tested its applicability to the customer’s experiential and situational perspective. The results indicate that customer satisfaction and the amount of investment made by customers positively influences their loyalty toward a firm’s offerings, while the quality availability of attractive alternatives negatively impacts loyalty toward the firm’s offering.